The Marq is a new build, mixed-use development for The Crown Estate, occupying the prominent corner site of Duke Street and Jermyn Street. We have optimised and developed the approved planning stage proposal and are delivering a building which incorporates a number of new technologies and enhancements to the design. A ceremony was held in July to celebrate the ‘topping out’ of this exciting new building. It will be one of the UK’s first to be specifically designed to achieve ‘core and shell’ WELL Gold Certification. In addition, it is aiming to achieve BREEAM Outstanding for the office space. The cladding was designed and constructed using a precast backing panel system which incorporates Portland Stone with brick facing finishes and integrated windows. The large panels measuring 8.5 metres by 4 metres were rapidly installed at a rate of 3 to 5 panels per day. 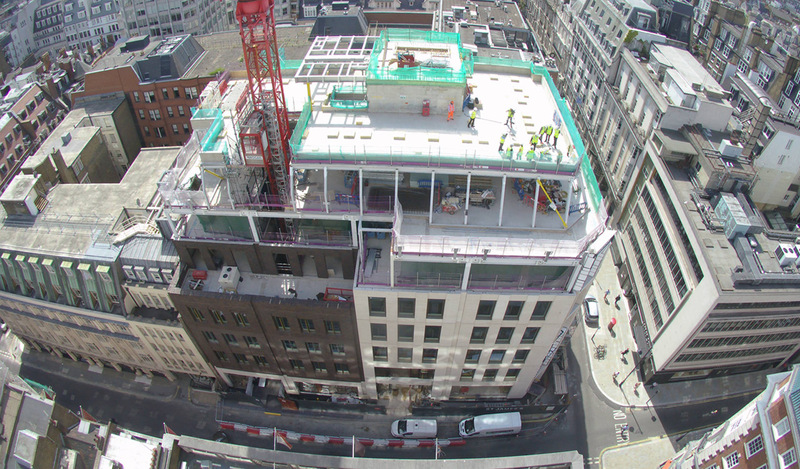 Delivery of the scheme in the BIM environment was integral to this achievement. Our design enhancements also include the incorporation of stunning new public art by Jacqueline Poncelet. The imaginative proposals include carved stonework with gilding to the exterior, stunning patinated bronze entrance gates and terrazzo artwork to the reception. For further information see our project page.